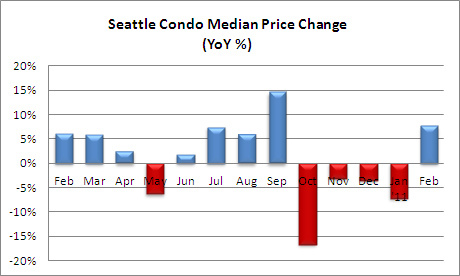 February took an unexpected turn as the median Seattle condo selling price rose 7.66% for the month to $312,750…a 14-month high. That’s an increased median selling price, not necessarily an increase in value. Overall, I believe condo values remain depressed and will continue to trend downwards. What we’re seeing is a shifting of the median point resulting from a turnaround of the high-end market and fewer lower-valued condo sales. Through parts of 2009 and the first half of 2010, the first-time home buyer’s tax credit weighted Seattle condo unit sales towards the lower pricing points. At the same time, many high-end buyers shied away from investing in the gluttonous luxury condominium market. Now we’re seeing a reversal. Last month, the number of unit sales priced under $300,000 dropped 15.4% while the number of unit sales priced over $500,000 jumped 92.9% and $1 million-plus sales tripled compared to the same period last year. Granted, that’s just one month’s figures, but the trend has been holding for some time now. 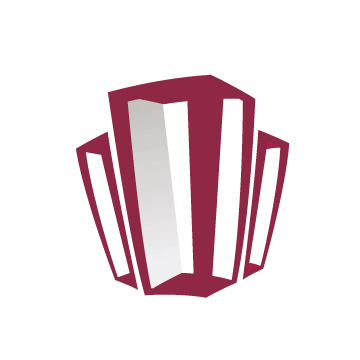 As expected, the number of pending transactions and closed sales lagged behind last year’s volume, down 21.4% and 5.2% respectively compared to February 2010. Without sounding like a broken record, the April 2010 deadline for the tax credit drove higher than normal sales volume last spring. Compared to January, the number of pending and closed transactions also dipped. There were 1,100 active listings in the MLS last month, which is increasing every month. 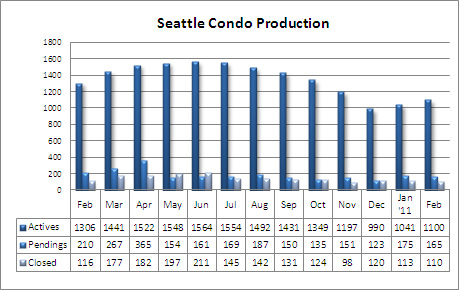 However, that was well under the 1,306 condo listings last February. The decrease may be attributable to potential sellers holding out for the market to rebound or that are so exasperated they are waiting for the property to foreclosure rather than try to sell short. 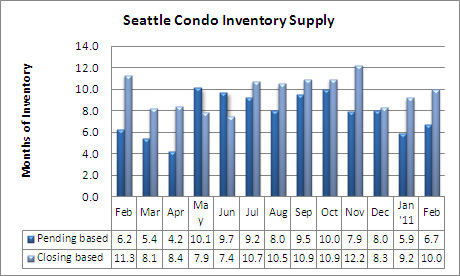 Nonetheless, the inventory supply rate remains high at 10-months of supply based on closed sales. The pending-based method suggests a more reasonable 6.7-month rate. However, given that most pending short sale transactions fail to close, it’s a less reliable measurement. In light of frequent news reports about the depressed housing market and economy, condo sales activity have not fluctuated that significantly over the past six months. The seasonal change is also beginning to bring buyers out. Are you one? If not, what factors are influencing your decision? On a side note, I did want to mention the Mortgage Credit Certificate tax credit. 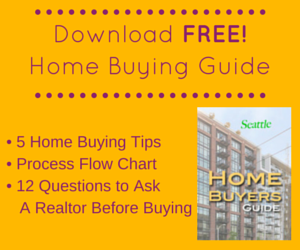 Not many first-time home buyers are aware of it as there are some limitations and qualification requirements, but it is potentially worth a few thousand dollars annually. Belltown experienced a one-month bounce with a 31.3% jump in median price and more sales and closings compared to last a year ago. 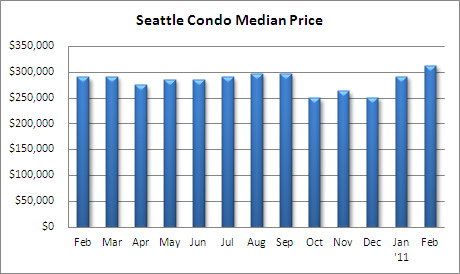 Prices in Northeast and West Seattle areas also reflected higher median selling prices, while the condo sales and prices in the Capitol Hill area lagged. isn’t this increase in beltown’s median price due to the one investor that bought 10 or so units at olive8? Douglas, it had a negative affect on median price. Excluding those sales, the Belltown/Downtown (Area 701) median price would have been $502,000. It is good to see a rise in median price and some what of a decline in listing inventory. 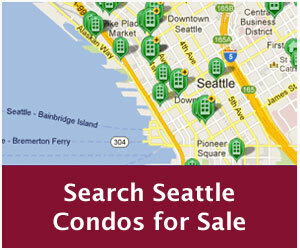 Do you know on average the listing to closing ratio is on Seattle condos? Great post, very informative. The Vancouver Real Estate market is seeing somewhat of the same thing. Our prices are still at a all time high, and there is a buyer surge in the market. Especially coming from foreign investors (mainly Chinese and European). It seems like prices may go downward in the next few months as we’ve been seeing reductions in mainly the condo market. However, detached homes are still holding their value!